Times have changed incredibly quickly when it comes to the types of content we now consume on a daily basis. Whether you work for a b2b or b2c company, it is always important to remember that behind every screen is an individual. In the b2b world, the people behind the screen may be in work mode and engaging with content of a different subject matter than they might do at home, but as individuals, both consumer and work content will stand out to them in the same way and that’s important when considering b2b marketing strategies. Context – first things first: why are you creating this piece of content to begin with? Do you want to generate leads? Create brand awareness? Position yourself for an upcoming event? If you can’t answer this question, then stop and think before you go any further. The next question you should be asking yourself is, what is your audience going to get from engaging with your work? Are they going to learn something new? Are they going to be entertained? Are they going to want to get this information from you? If the content isn’t directly relevant to your audience and is unlikely to benefit them, why create the content at all? Convenience – as marketers, we are bombarded with statistics about declining attention spans, the throwaway society and low engagement rates. We are living in a world where everything constantly feels urgent and the same goes for the content we consume. Make sure the message, outcomes and takeaways are all easily extracted from your content; a 15 minute video about your new rebrand isn’t going to hold viewers’ attention! Creativity – congratulations, you wrote a blog post! In 2018, an average of 4000 blog posts were published every minute, which added up to over 2 billion in the year. With those kinds of numbers, it’s a fair assumption that the article you’ve just finished writing has been written before, and even if it hasn’t, how are you going to be heard over all the content noise? People have branded 2019 as the year of the podcast and, with 20 million active blogs and 1 billion YouTube users with channels, it’s not surprising that people want to take a different approach to content mediums. Unlike the blog and video scene, there are far fewer total podcast channels out there, totalling around 550,000 (even fewer in the b2b space), which means far less competition. On top of this, engagement rates are far higher for podcasts than they are for video, with 80% of listeners finishing or almost finishing episodes. Podcasts aren’t a new form of content but it’s only relatively recently that they’ve soared in popularity and larger companies are taking full advantage of the fact. Spotify acquired Gimlet Media, a start-up podcast network, and Anchor, a podcast publishing and monetisation tool, in early 2019, as well as updating its app UI to include a separate tab for podcasts. Facebook, YouTube and Periscope have all successfully integrated live streaming onto their platforms with fantastic adoption levels from their users. In early 2019 LinkedIn started venturing into the live streaming space with the release of LinkedIn Live. Certain beta users in the USA currently have access to the feature, but we can expect it to roll out globally very soon. LinkedIn Live gives b2b brands the perfect opportunity to put a face to the company and engage with their audience in real time, whether that’s through doing a Q&A, showing an event or tradeshow, or even just giving an insight into day to day work and company culture (fantastic for recruitment processes!). As far as b2b marketing strategies go, live streaming has its risks. Not being able to edit footage before showcasing it to the world means external factors which are out of your control may pop up and go against your brand image. PROS: allows the brand to communicate to the masses on a person to person level. CONS: risk of saying or showing something which can damage brand perception. B2b companies are still entrenched in laptop and desktop life, but with more remote working and connectivity, there’s no denying that mobile has earned its place in b2b content. Portrait video is tailored to the growing “mobile-first audience” and can now be found on all social media platforms. 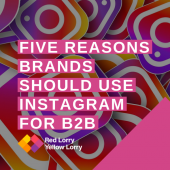 Instagram’s IGTV is the best example of vertical video done right and this can be harnessed by b2b brands to target their audience when they’re not at their desks. Currently, 96% of all videos watched online are on mobile and though that percentage will be smaller in the b2b world, ignoring the fact that individuals are consuming b2b content on their phones would be a missed opportunity for marketers. A healthy mix of both portrait and landscape videos should be incorporated in a b2b content marketing plan when thinking about video. As a marketer, it’s up to you to work out what video subject matter fits what video type. PROS: engage with your target audience with higher engagement when they’re not at their desk. CONS: desktop viewing isn’t as user friendly because of the black bars displayed on the sides of the video. People like engaging with people, not a faceless company. It is much easier to acquire clicks and conversions from your target audience when they can get a feeling of who created the content. Encouraging your employees or colleagues to create content and giving them credit through things like author pages on your blog or tagging them in social media posts which promote the piece of content, will increase employee advocacy and foster more outside trust. Gamifying content creation by turning it into a competition can also encourage people in your company to create more and, most importantly, better content. Incentivising and rewarding the content creators can be a big driving factor in creating content and driving engagement. By rewarding the top creators (most pieces of content, most clicks, etc.) you will increase your employee advocacy and they’ll be more lightly to promote the content themselves, which is hugely important. Allowing the doors to open between the company and the content creator will encourage the free movement of followers to your company pages, making it one of the b2b marketing strategies you shouldn’t ignore. PROS: increased employee advocacy, clicks and sales. CONS: maintaining company standards can be hard when content is coming from many different people, so it is important to be extra vigilant. This one isn’t exactly new when it comes to b2b marketing strategies but it’s as important as it’s always been. Collaboration is an important part in all areas of business, including content. By collaborating with your clients, non-competitors in the same industry and thought leaders or influencers, you can increase your reach, engage with a broader audience and showcase yourself as an industry expert in your field. Collaborating with others doesn’t have to be an arduous task where it takes months to create a single piece of content. Often these are the ones that get over-hyped and flop. Simply asking people in your circle to provide quotes for an article, to be a part of your video or podcast, or to have a joint content brainstorm, are all great ways to make the most of each other’s audiences. On the other hand, the content which is being made doesn’t have to come from you. Providing quotes to journalists who are writing in your vertical can help get your company name out there, as well as help build the personal brand of the person giving the quote. Journalists will sometimes provide backlinks to your site which can help boost SEO (search engine optimisation), meaning people will be able to find you more easily in the future. At the end of the day, providing value is key, whether you are including someone in your content, or you’re being included by someone else. PROS: expand your content reach and get your name out to people who may not have heard about you. CONS: it’s even more important to create high-quality pieces of content when collaborating. Having a media strategy also makes sense when approaching journalists. You don’t have to be The Dodo, sharing “triggering” videos of abandoned puppies to get your engagement up, but harnessing the power of emotion can make your b2b content go further. By making somebody empathise with the core of your content, whether that’s bringing out happiness, sadness or frustration, your audience is more likely to engage, share and have their say. Bringing out the emotional side of a b2b piece of content isn’t as easy as b2c, but the one thing which you can incorporate to bring it to life is storytelling. Bringing real life situations, people or their experiences into your content can help your audience relate to what you’re talking about. For example, corporate responsibility is a hot topic now, triggering debates about whether brands are “cashing in” on the world’s problems or whether they’re bringing them to light and addressing them on their platforms. A good example of this is the controversial Gillette ad from January 2019, “The best men can be”, which tackled the issue of toxic masculinity. 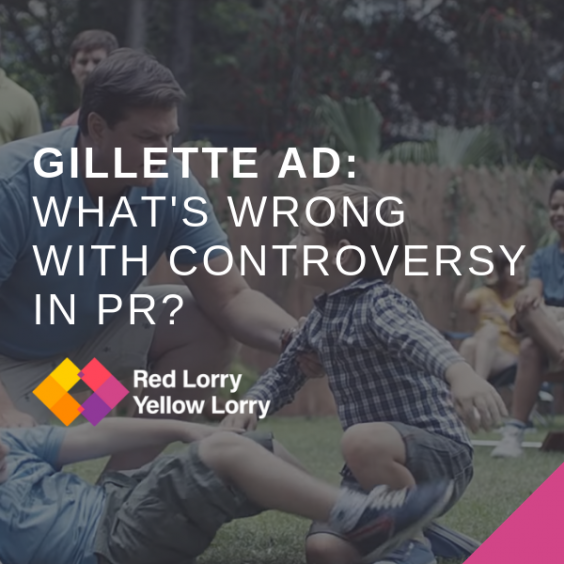 Many people believed it wasn’t Gillette’s place to comment on this sensitive issue, but as planned the ad went viral. Gillette received criticism on both sides; one, for attacking men in general, and two, for not having done anything about its“pink tax” which increases the overall cost of their women’s products. It’s a fantastic example of how emotive content can trigger widespread interest and engagement. PROS: the audience can empathise with the core of your content and relate to it more than they may have otherwise. CONS: make sure any sensitive issues are directly related to your brand while showing you are actively trying to fix the problem. When thinking about your content, these b2b marketing strategies can give you an edge over your competitors, but it’s important to remember that content promotion is the flip side to creation. 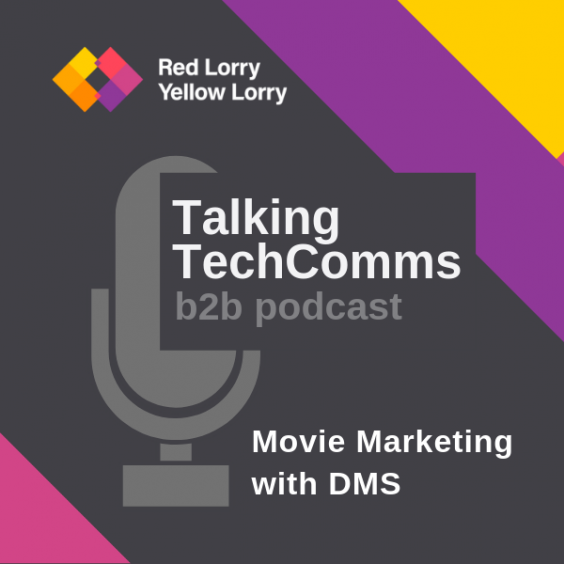 To find out how Red Lorry Yellow Lorry can help you with your b2b tech content marketing and PR, drop us a line at hello@rlyl.com or visit our contact page. 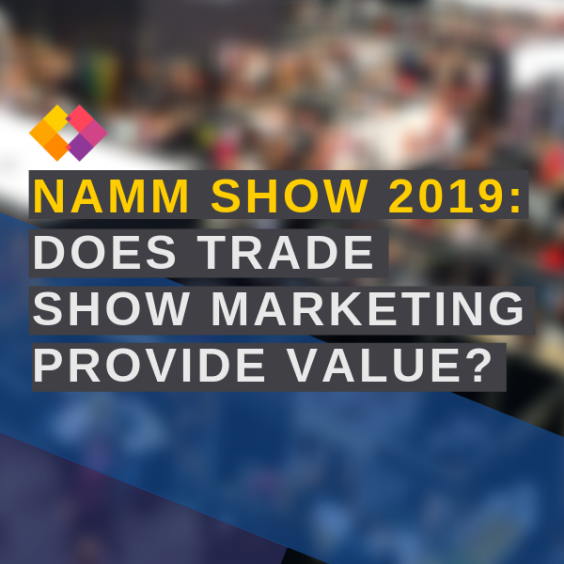 NAMM: does trade show marketing provide value?